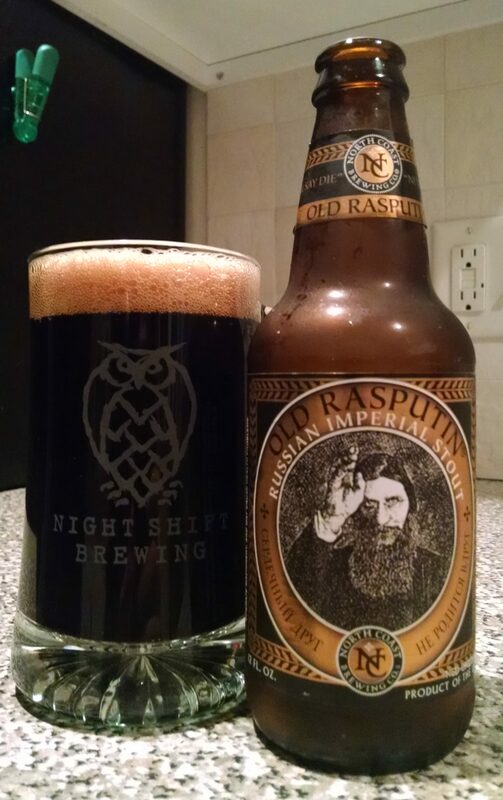 It’s getting cold out there and it is time to warm up and fully embrace stout season. For my next beer, I reached deep into my closet and dusted off a bottle I received last Christmas, shortly after Dann and Martha Paquette announced a conclusion to the Boston chapter of their Pretty Things Beer and Ale Project. 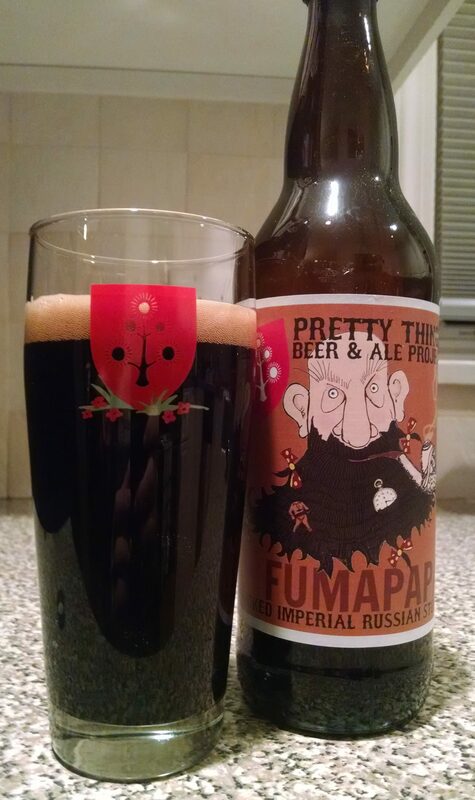 Description: The brewery’s archive lists this brew as a variant of their popular Barbapapa Russian Imperial Stout. Brewed without the use of adjuncts or barrel aging, the base stout was entirely the result of double mashing and a whole lot of barley. The Fumapapa version I had on hand is said to feature a slightly sweeter finish and the added touch of smoked barley. My bottle was dated December 2015, making it probably one of the last Pretty Things releases to go out. It seemed necessary that I borrow my wife’s Pretty Things glass for the first pour. Appearance: The body was a deep, dark black topped off by roughly half a finger’s worth of thick tan foam. The head stuck around for most the beer, settling down to a thin layer across the top and sides while leaving nice lacing on the sides of the glass. Smell: Sweet malts, and bourbon-like heat. Taste: Sweet, chocolate malts asserted themselves right from the start, joined later on by a bit of roasted coffee and a subtle yet distinct smoked flavor towards the end. The finish also brought a sweet, boozy character. As the beer sat in the glass and had a chance to warm up, the alcohol at the end took on a bit more heat and the smoke picked up a bit as well. Lots of big flavors going on this beer, but they all fit together wonderfully. Mouthfeel: Creamy, thick, and super smooth to drink. The low carbonation made it easy to let all those bold flavors sink in. Hype: Nostalgia is the better word. I miss having this brewery around and only have one more beer of theirs left in my closet. Overall: This was a WOW! beer for me. Not being a big fan of smoky beers, I was a little hesitant going into this bottle but that aspect ended up coming through in a way that was nearly perfect for my preferences. This beer was a sipper for sure, but it drank so smoothly that it almost felt like it had no business being 12% despite tasting a bit hot. Everything worked in this beer, the smell was inviting, the feel was perfect, and every single part of the sweet/boozy/roasty/smoked flavor combination was deliciously enjoyable. And here is a look at the other bottle I brought home with me following my last trip to Night Shift. 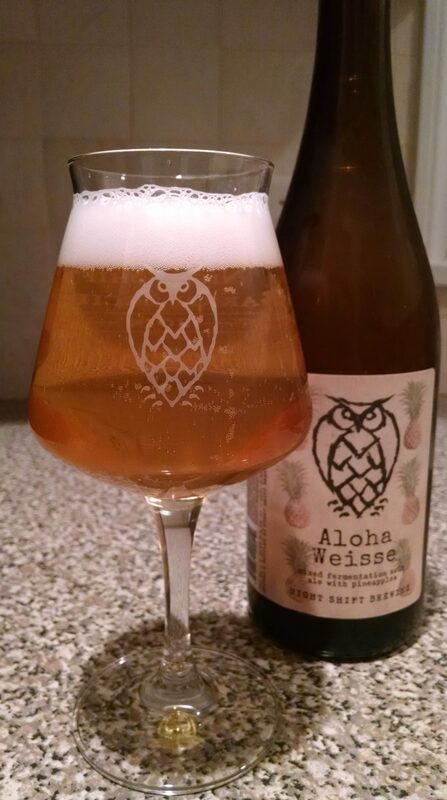 Description: Similar in concept to my previous review, this was a mixed fermentation sour ale brewed with pineapple. You can take a closer look at the label here. The 750 ml bottle cost $12, which seems like the going rate for this series. I was once again compelled to break out the 2014 teku glass. Appearance: The body was a surprisingly clear light straw yellow. A foamy white head formed with the pour, fed by little bubbles running up the glass. Smell: Lightly sweet with a pretty noticeable layer of funk on top. Taste: Tart and sweet upfront, tangy pineapple clearly stood out as the dominant flavor. For the finish the beer took on a moderate hay-like funk in comparable strength to the remaining pineapple. The two aspects mingled nicely into one funky, fruity whole. Mouthfeel: Medium bodied with that usual syrupy finish. The carbonation level was actually relatively low considering all the bubbles I saw on the pour, it really only showed itself at the end. Hype: Mostly curiosity on my part. As I mentioned in my last post, I was really interested to see where Night Shift was going to take their Berliner Weisse lineup and how it would grow with the brewery. Overall: I liked this a lot, though it certainly helped that I am a fan of pineapples. I thought the beer showcased both the fruit and sour aspects quite nicely. Light and refreshing, my only wish for this beer was that I was drinking in much warmer weather. While picking up my Barrel Society bottles the other day, I couldn’t resist coming home with a couple of other goodies as well – new installments in Night Shift’s Weisse line. They seem to branching out from their four traditional entries and I was eager to give those efforts a taste. First up is the brew they didn’t have available on draft the day of my visit. Description: Labeled as a “mixed fermentation sour ale with raspberries,” the 750 ml bottle cost $12 at the brewery. The bottle for this review was from the October 2016 batch. Since drinking this somehow felt like it would be a return felt to the Night Shift of old for me, I drank it out my 2014 Barrel Society teku glass. Appearance: The body had a very nice looking pinkish/purple color with some bubbles running up from the bottom of the glass. A slightly pink fizzy head formed on the pour and quickly bubbled away to leave some lacing across the top. Smell: Tart and fruity berries, with a moderate funky/sour aroma towards the end. 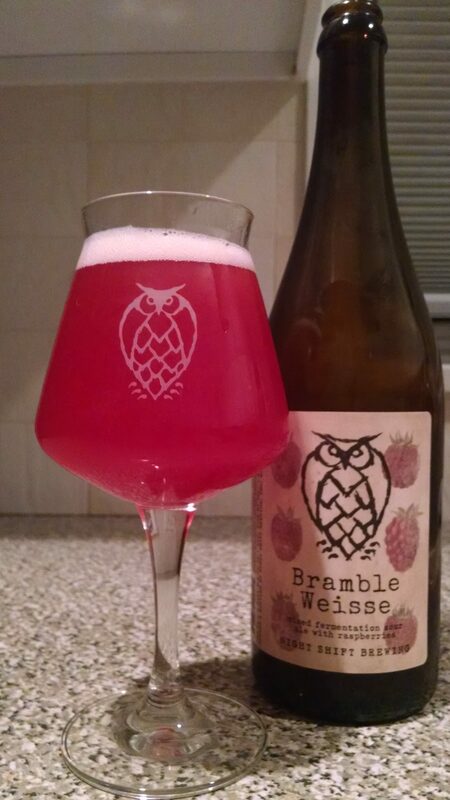 Taste: This beer was all about tart and sweet raspberries. Mostly sweet and fruity upfront, it gradually took on a more tangy and tart character as it went on. The finish went back to a sugary, fruity sweetness mixed with slightly sour, funky flavor. I found it a bit acidic towards the end as well, especially as I made my way through the bottle, but overall it was pretty refreshing and mellow throughout. Mouthfeel: I found it tough to get a good handle on this aspect, but I would say the beer was on the thinner side with the thicker, syrupy finish I usually get from this style. The carbonation level was pretty robust, with plenty of little bubbles in every sip. Hype: There was some excitement around this beer, especially since the brewery in part built their early reputation on their Berliner Weisse series. It was actually those earlier brews that introduced me to this style, so I was very curious to try out one of their newer creations. Overall: I enjoyed this a lot and thought the beer was quite refreshing. The taste and feel made it seem not entirely unlike a raspberry rickey, albeit a really damn good one that just happened to be a little bit funky as well. A worthy addition to the Weisse lineup. I am officially kicking off this stout season with one of the beers that got it all started for me. 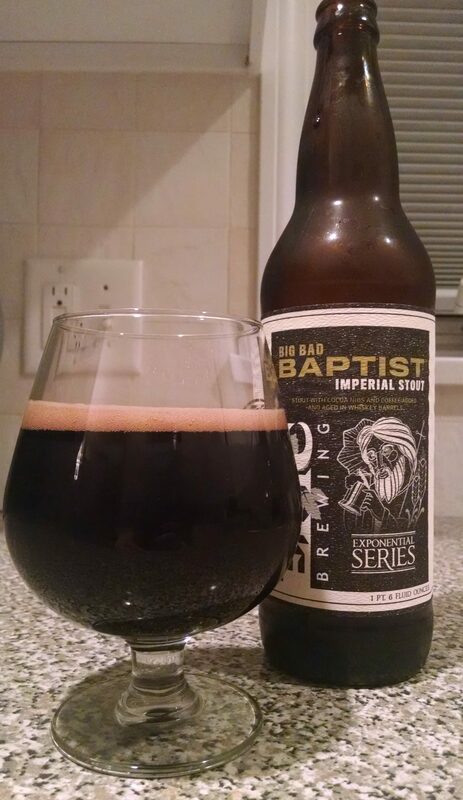 I was really into big stouts when I first began exploring the world of beer and this was among the first to really blow me away. Description: The description offered by the brewery is short and to the point: It’s a rich, intense brew with big complex flavors and a warming finish. The going rate for this beer in my area $10.99 for a 4-pack of 12 oz. bottles. Appearance: Poured a deep black body topped off by about a finger’s worth of tan foam. The head slowly faded down to lacing across the top as the beer went on. Smell: An inviting combination of lightly sweet and roasty malts. Taste: Intense and dark. The aforementioned malts really stood out, as did hints of dark fruit and a big helping bittersweet dark chocolate. The finish had a healthy bitterness to it, once again showcasing bittersweet dark chocolate in conjunction with roasted coffee. As the beer sat for a bit, a warm alcohol presence built up towards the end; just enough to become noticed without taking over the beer. Mouthfeel: On the thicker side and smooth despite some tiny bubbles on the edges of each sip. Hype: Hype is the wrong word for this beer. Although widely respected and held in high regard, it may get taken for granted a bit on account of being so readily available. Overall: Just as good as I recall. It still has a place among my all time favorites and I definitely recommend trying this out if you haven’t before. Don’t pass this one up. With work being pretty hectic this past Friday, no one in the office had time to make our usual run over to Trillium. Fortunately, the convenience store across the street from us maintains a small but usually pretty decent beer selection. From the selections my boss came back with, this one seemed to call to me. The cool label may have had something to do with it. Description: You can check out the brewery website for their full description, along with a nice JPG of the can art, here. 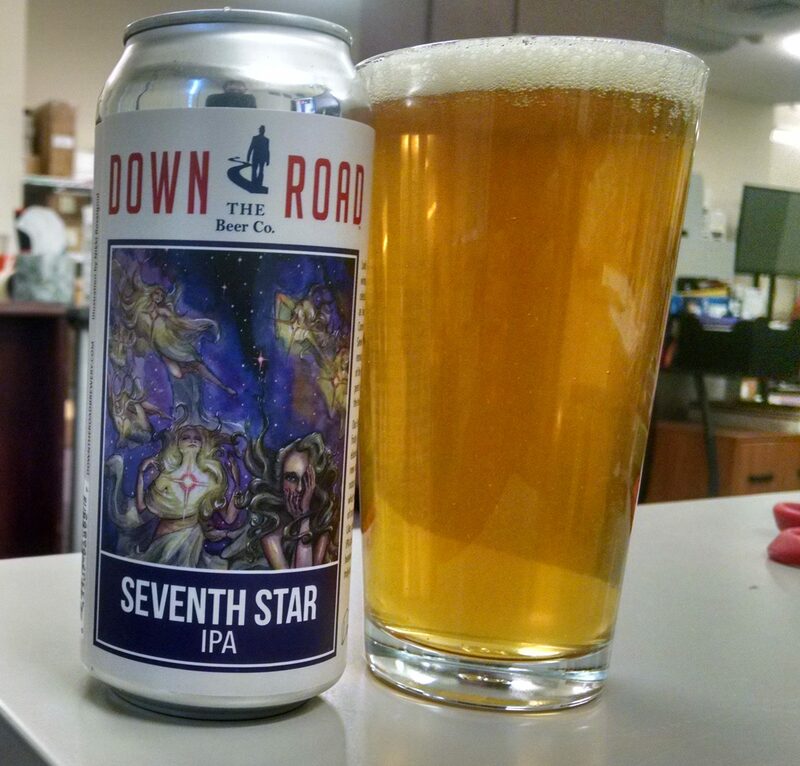 To summarize briefly, this was brewed with Idaho 7 and Azaca hops to impart a distinctly fruity profile. I believe I saw a $14.99 price tag on the 4-pack of tallboys. Appearance: The body was translucent and had a light amber/yellow color to it. A bubbly white head formed with the pour and stuck around for roughly half the glass. Smell: Sweet and fruity, with melon being the standout aroma. Taste: Started out with a sweet melon profile upfront that took on a more tropical juicy taste about midway through. For the finish, there was a moderately resinous grassy hop bitterness coupled with more sweetness that I would best describe as a mix of melon and strawberry. Mouthfeel: Medium bodied with a creamy smoothness that made it feel just a touch thicker than it probably was, especially with its slightly less than moderate level of carbonation. Hype: Just curiosity. The label called to me and the brewery really is just down the road from me in Everett, MA. Overall: This beer was a pleasant surprise. I haven’t had anything from this brewery since I hit up their stand at a Brew at the Zoo event a couple of years ago and feel like they’ve come a long way in that time. I really liked how the melon stood out and how the finish was able to assert the hops without blowing away the other flavors. Worth checking out if you come across this.